» City Attorney Carmen Trutanich: Dawn of a New Era in Billboard Law Enforcement? City Attorney Carmen Trutanich: Dawn of a New Era in Billboard Law Enforcement? For anti-billboard activists, the end of Rocky Delgadillo’s eight years as L.A. City Attorney couldn’t come a moment too soon. Getting elected with the help of free billboard advertising, allowing himself to be publicly feted by a major billboard lobbyist, brokering a disastrous lawsuit settlement with the same companies that plastered his face around the city-all reasons to say good riddance and await the imminent dawning of a better day. But what can those committed to defense of the city’s visual environment against an onslaught of digital billboards and supergraphic signs reasonably expect from the new City Attorney, Carmen Trutanich, after he takes office in just a few days? In an interview prior to the March 3 primary election, Trutanich said he would set up a task force in the City Attorney’s office to deal exclusively with billboard issues. In addition, here are two statements made in response to written questions put to candidates on billboard and sign issues last February. Given that a number of companies cited for putting up illegal billboards and supergraphics have gone to court to challenge the city’s enforcement power, and given that the courts have enjoined the city in several cases from taking action against a company’s signs, one might be excused for viewing Trutanich’s threats with a degree of skepticism. In other words, don’t hold your breath waiting to see a billboard company CEO in handcuffs being led to jail. Trutanich will inherit those lawsuits, as well as other legal issues, one of the most contentious being the 2006 settlement that gave Clear Channel and two other billboard companies the right to convert 877 conventional billboards to digital and grandfathered innumerable non-complying signs. This settlement, which exempted those digital billboards from any zoning regulations or environmental review, is regarded by some legal experts as a blatant violation of public process, which requires public notification and hearings on all land-use matters. 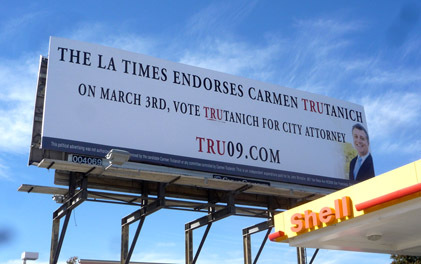 In the interview with a representative of the Coalition to Ban Billboard Blight, Trutanich agreed that the billboard settlement should be reversed, although he didn’t offer an opinion as to how this could best be accomplished, saying that if elected he would pursue the matter with those most closely involved with billboard litigation in the City Attorney’s office. There are other issues awaiting the City Attorney-elect when he steps into the office occupied for the past eight years by Delgadillo. One is the proposed sign ordinance filled with new regulations his office will be responsible for enforcing. When the ordinance reached the City Council last month, that body opted for delay, ostensibly to give Trutanich a chance to weigh in, although the more skeptical would point to the fact that councilmembers were being heavily lobbied by business groups, labor unions, sign companies and others who see the proposed ban on digital signs and other limitations as harmful to their interests. Another are the hundreds of mini-billboards owned by Fuel Outdoor that have sprouted up the past few years. That company sued the city but lost its appeal in federal court, rendering every one of those signs illegal. Shouldn’t the company be forced to take them down? And should it be allowed to walk away with all the revenue collected while they were up?